Lev Manovich is one of the most significant voices in internet criticism today. Working as an artist and net theorist as well as a professor in the Visual Arts Department at the University of California at San Diego, he also directs the Software Studies Initiative at the California Institute for Telecommunications and Information Technology. As well, he is a visiting research professor at both Goldsmiths College, London, and De Montfort College as well as the College of Fine Arts at the University of New South Wales in Sydney. Manovichs most well known book, The Language of New Media, has influenced scores of students, artists and activists since it was published in 2001. In The Language of New Media, Manovich offer a detailed and rigorous theory of new media. Placing new media within the histories of visual and media culture, Manovich examines its reliance on the conventional apparatuses of old media. Manovich uses film theory, art history, literary theory and computer science to develop new theoretical constructs such as cultural interface and spatial montage. Lev Manovichs latest book, Software Takes Command, was released in 2008 under a Creative Commons license and will be available from MIT Press in 2010. Software Takes Command deals with the rise of software as the dominant force in society and culture. Manovich proposes a new system of study—the system of software studies—to investigate both the role software has in forming society, and the cultural, social and economic forces that shape software itself. Lev Manovichs creative projects include Soft Cinema (2002-03) which is a dynamic computer-driven media installation. The viewer is presented with an infinite number of narrative films constructed at random using custom software. The computer selects clips of both audio and visual works from a database to create and original and unique random narrative. At UCSD, Manovich founded the Software Studies Initiative which seeks to create effective tools for the study of software society. Viewing software as a layer which permeates contemporary society, the Software Studies Initiative seeks to understand contemporary techniques of control, communication, decision making, memory, vision and writing. Lev Manovichs books include The Engineering of Vision (1993), The Language of New Media (2001), and Software Takes Command (2008) which available for download through a Creative Commons license. Lev Manovich currently blogs at databeautiful. Graphic designer Nicholas Felton is obsessed with data. He knows how many songs heâ? ?s listened to and how much it costs him per mile to fly. Felton visualizes these numerous details in personal â? 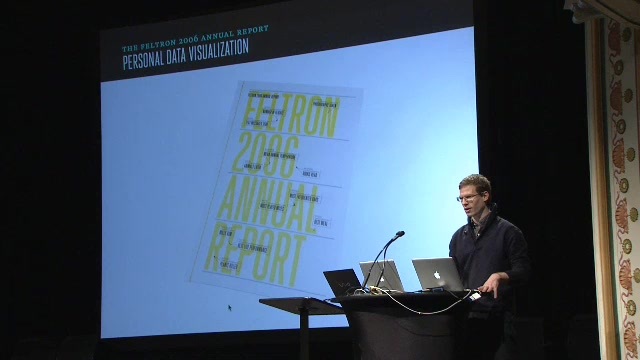 ?Annual Reports.â? At PopTech 2009, Felton examines what a weeklong-snapshot of New York Timesâ?? front pages reveals about America.